10 days away and I was actually happy to only gain 5 pounds. I also stopped taking my garcinia cambogia. For gaining 5 pounds weight watchers rewarded me with another point to eat. Should I be thankful for that? Uhm… Not really. 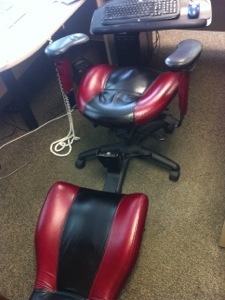 Even though I am still down close to 40 pounds since January I was also rewarded with breaking my deluxe and very expensive office chair!! I will attach the photo here. 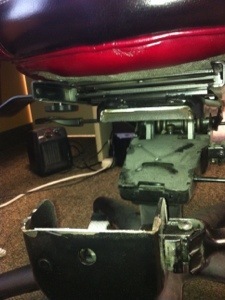 I basically leaned back like I have for 5 years and the solid metal simply SNAPPED! Ouch that hurts in more ways than one.